TextMe has launched its new app, Simkarma, which will allow Android users to earn free mobile internet across all major carriers in India by completing offers from advertisers. Leveraging its expertise in sponsored communication, TextMe said that it is now providing 700 million Android users in the Indian market with free data through its new app, Simkarma. The company said that more than three quarters of the Indian population can use their smartphone to earn free data to make calls, send texts, use apps, play games, browse the web, and more – at no cost. Users could turn their dataless smartphone into a connected device and use endless apps, make calls, texts, and browse the web, just by interacting with brands of their choice. The sponsored communication model is a win-win for both users and brands, the company said, adding that users are able to get access to valuable communication services for free by knowingly interacting with brands of their choosing, while advertisers are able to showcase their brand. After completing offers, Simkarma allows users to redeem their rewards directly on their data plan by transferring airtime from their accounts onto their SIM within seconds. Users are then free to use that earned data toward any app, texts, calls, or other data based services. By bringing sponsored communication to more users around the globe TextMe is able to provide more users with free data. 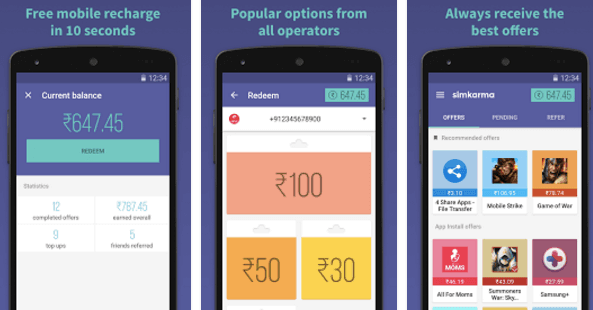 Users can also invite friends to use the app, in exchange for earning extra rupees toward their free data. Very easy, got my recharge of 100 Rs. Then 50 Rs. again. Why not work for you? That feeling when you complete all the offer but not able to redeem !!! ha ha ha…..that happens very often and you will feel like April fool. same thing with this app ! !